I get emailed a lot of questions, some I can answer privately and others I think hmmm other people might wanna read this to. One of these emails was about what to do when you lose a pet hamster. So to try and help, I have put together a little list of what I do when I lose a loved hammy. I have lost lots of hamsters over my lifetime. 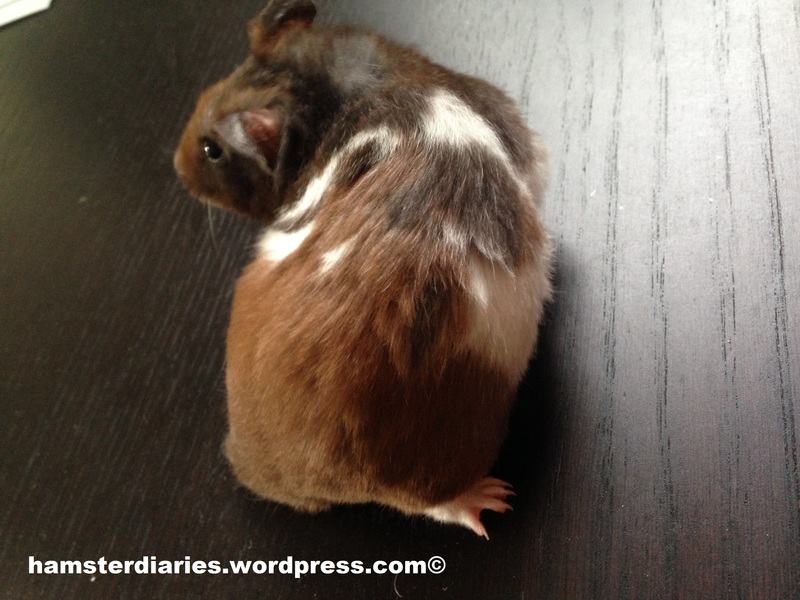 Over the course of this blog alone, I lost my 3 hammy stars AND 13 beautiful baby hamsters. If anyone can understand the grief of losing a pet, I can. Cry. Cry as much as you want to and feel the need to. 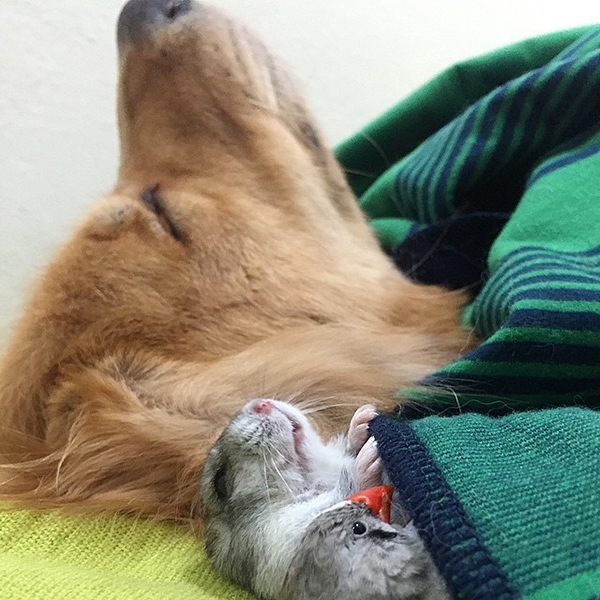 Hamsters are little members of the family after all. They have been with you for years and when they pass away, it hurts! It is okay to cry and it helps to cry, so let it all out. Put all the pictures of your passed hammy up wherever you are. On your bedroom wall, on your school folders, on your work desk, anywhere! I have my favourite picture of Casper snuggled up asleep inside my blanket as my mousemat at work and pictures of all 3 of them on my electronic photo frame so every 30 minutes, I get to see a happy pic of my fur babies. Make a memorial for them. Every hamster since I was a kid has been buried in my garden. 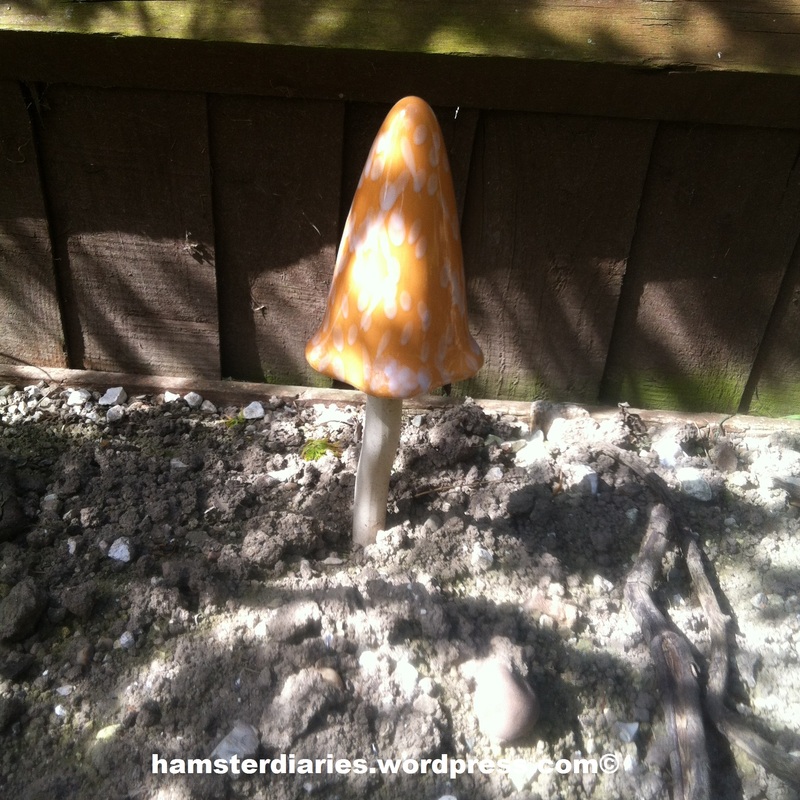 There is a row of ceramic toadstools along the back fence in the garden so I can see where all of my pets have been laid to rest. Its a lovely reminder 🙂 They are all different colours so I can recognise which hammy lays where. When the babies died, I planted an orchid for them in their memory. It was a beautiful plant and I thought it a fitting tribute for them. Plants and gravestones are a great way to distract you from the negative of losing a loved pet and a lasting tribute to their memory. It may seem drastic and the last thing you’d want to do but I promise you a new baby hamster is the perfect therapy. You get to have all the fur snuggles and a whole new personality to get to learn and love. Whenever you are ready and have grieved for your lost pet, I cant recommend enough the benefits of getting that cage all cleaned and sorted ready for a new furry-face. You can relive the great times of your lost pet, with a new one. Offering a pet a new home is the most rewarding thing ever and it will keep you smiling, guaranteed!! You can tell your new fur baby all about their older brother/sister that has passed away. I found the whole experience of a new pet, the best remedy for a broken heart. Banjo is now my little rock – I couldn’t be without him. Nothing and no one will replace your lost hamster and it really is the worst pain you can feel. But this doesn’t mean your world should crumble and end. You just have to start a new chapter as difficult as it seems. Hiding Hamster Or Just Hygienic?? I often moan about how difficult it is to get a focused photo of Banjo. He is the biggest fidget on the planet and makes it impossible to get a good snap. For example, there we were having a lovely snuggle on my return home from work and the little cutie just couldn’t handle his picture being taken. Okay so I am exaggerating a little.. he MAY have been having a thorough clean whilst being cuddled. I just caught him mid face wash. I suppose I should be proud he is keeping his paws and whiskers clean. Even hammy boys should have good hygiene right?! What do you make of this pic? Hiding his face from the blogosphere?! Or having a good wash for the camera?? So I have received this question and concern SOOOOO many times, I figured it was about time I addressed this concern. Excellent question and the very simple answer is NO you do not have to worry at all. These ‘moles’ on your hamsters sides are scent glands. They often aren’t covered by fur and can become more apparent as your hamster gets older and their fur thins out anyway. On Banjo they aren’t too obvious but take a look at the picture below. You can see the parting in his fur and a ‘mole’ smaller than a penny on his hip. These glands are nothing to worry about and are for marking territories and attracting a mate. Hamsters can be prone to Scent Gland Infections. This can cause your hamster to be unfriendly and nippy. Keep a close eye on their movement – if they are really struggling to walk or curl up, it could be a warning sign of an infection. If your grumpy hamster lets you close enough, check their hip spots for any inflammation or puffiness. If there is any fluid or any noticeable swelling, you should take an immediate trip to the vet to get checked out. 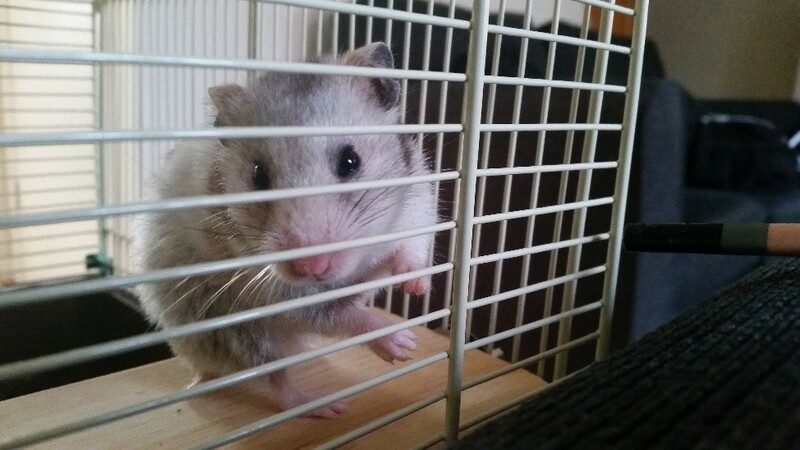 Here is another picture of my late hamster Dexter. You can see the disturbance on his hip where his scent gland is. So basically the long and short of this is, there is nothing to worry about. Make sure you know what is NORMAL for your fur baby so if there is ever a change or problem, you can catch it quickly and get it sorted. Do My Cheeks Look BIG In This? I stick my comments in here and there and write up a post when i get the opportunity but its a lot less frequent than before.. as I am sure you realise. Anyway I can’t have you going without a few Joey updates here and there. I definitely think Banjo has become more friendly and camera-brave these recent months. And as I try to take a picture of this dinner ritual, I think this little man got a bit protective of his corn! Check out the scoffing that this hamster has done! The SIZE of that cheek – WOW! hahah! Hope you have all had a great weekend and your little hamsters have been behaving themselves, no escaping, no stealing your remote control car and whizzing away? No..ah..good, but now I’m worrying myself that hamsters may take over the world..
Oh jeez…the poop…it would be everywhere! So recently I have been keeping a close eye on my little Cookie, as she has not been well. On Friday evening I noticed some strange colouring on the area where she pees. I took a closer look as I was a bit worried, unfortunately it was blood. 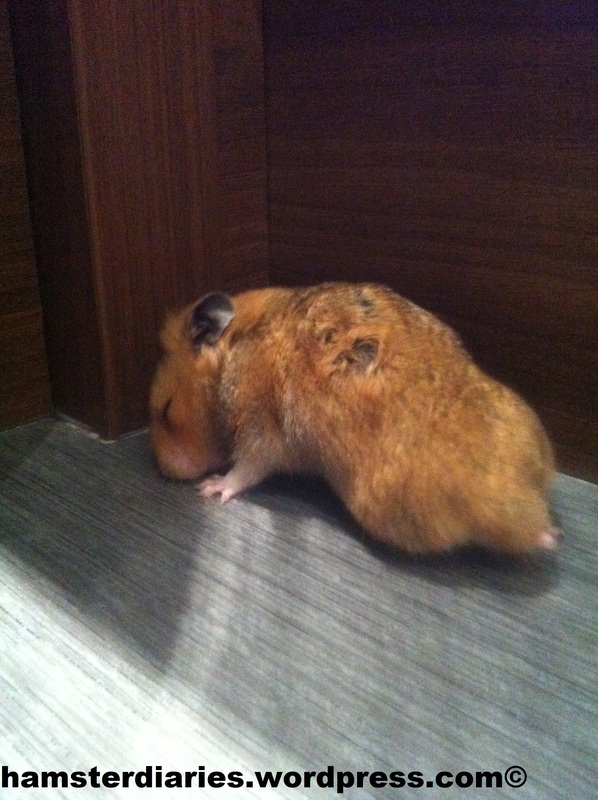 So, my hamster was peeing blood! I called the vet and got her in that evening. He was holding her and looked at me and seriously said the most hilarious sentence you can say to a person who has a hamster “do you think you could hold her still for a minute or so“ ….I must admit…I laughed so hard. I got told, it is either a UTI ( urinary tract infection ) or because she maybe older than we think, it could be a womb issue, so I was given the choice of either investigation or antibiotics. I chose antibiotics because if in the time of her having it, it got worse, she would go straight back. But right now it seems to be clearing, each day the red colour is less and less – yaayyyyy! So far I have not stopped laughing at her reactions to the anti b, she scrunches her nose up, sticks her tongue out, teeth together…. looks like a child sucking on a lemon! It is such a hilarious face for such a little Cookie. We love keeping up to date with Cookie and Hayley – Banjo loves sniffing the screen when I am typing too! We just thought we would add a little note on the end of this post to say how quickly all you hammy-mummy and daddy’s need to react when you see blood in their pee or on their bums. Hayley did the totally correct thing by going straight to the vets! Eve suffered with a womb infection from having her babies (read about it here) and the antibiotics weren’t successful and I will always wonder if I had acted quicker if she would have made it! 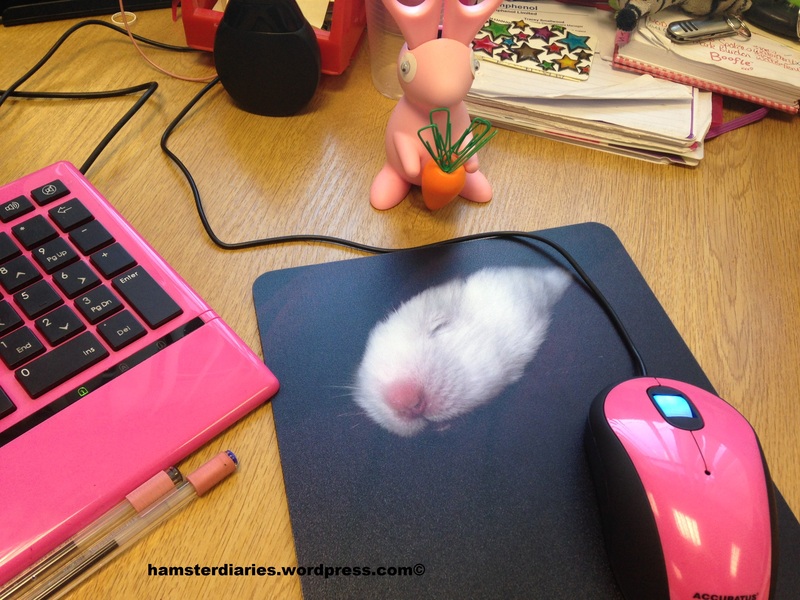 If your hammy has a bloody bum click here to read all about what to look for and what to do! Today, I thought I would write up a bit more of little Cookies history and more about her! So, Cookie was given to me by an old family friend. She was left in a house when her family moved out. She was left behind and we are unsure how long she was by herself. She was found in a cage with little food and little water, so it was suspected she went back to life saving burying and eating very little. She thought her daughter could deal with it. If the child got bored and the mother wouldn’t go near her…how would that end up? Don’t even want to think about it….. So, she ended up with me! YAY! I went out and bought her everything she would need, I spoilt her rotten, it was awesome……and expensive!! But I got home, put all her bedding in, put her house in, and some food and a water bottle. Half an hour later a woman arrived with a bag of goodies and a little brown carry box. When this little hamster came out I was so shocked by her colouring, her tiny toes and the cute nose…I put her in her cage and left her get on with settling in. Names…yes…names, it took 2 days and a lot if randomly shouting a name before I called her Cookie. The name was because of her colouring, she is such a friendly little munchkin and as silly as it sounds…now, I would be lost without my little Cookie Monster. So far she has cracked a leg, it healed awkwardly but she has never been in pain and has never stopped being a spider hamster and then falling on her face J she has been seriously ill in the heat, she never makes noise yet she was crying uncontrollably. ..which in turn made me cry. Name: Cookie , Age: unknown , Colour: a mix of black, white, grey and tiny pink nose and toes. She is toilet trained, she will never do it if she is out of her cage, ever. In case I don’t see ya, good afternoon, good evening and goodnight! 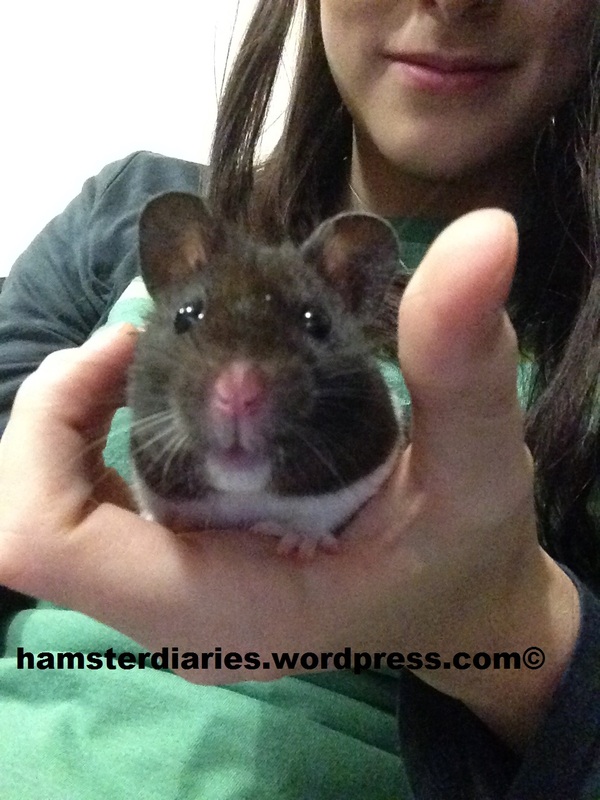 Hello again peeps and hamsters and…well…all other creatures! My little Cookie says hello and wishes you all well! I know I have touched upon the subject before of my hamster in the heat, but this is a little bit different today, getting a little bit more serious peeps!! 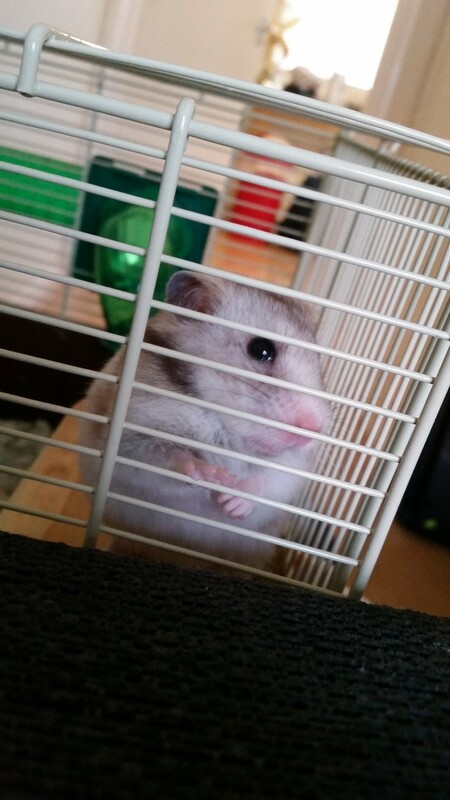 I love the little furry creatures that run around in their cages unaware of the big wide world they are a part of and keeping them safe is important, especially since this issue I am going to tell you about isn’t well highlighted when you have a hamster. Personally I found out when there was a small sign in my local pet shop! Now, at this time of year, when things are getting hotter ( unless you’re in Australia ) flies will start to drive you absolutely mad! Unfortunately they are also pests of hamsters, dogs, well any animal really! Flystrike is when flies lay their eggs, in this case, on a hamsters behind or even mouth. The eggs then start to hatch into maggots,( gross…yeah, I know) these maggots will start eating your hamsters skin, inside and out, wherever they can get to!! Basically, they will eat your hamster alive!!!! This can kill very quickly, but can be treated if found early enough!! The best way you can combat this is by keeping your little friends and their cage clean. I use small pet wipes each week on Cookie. If you keep them clean their chance of flystrike is greatly decreased. Enjoy the rest of the week peeps! I do hope I did not bore you with my last 3 posts. I hope you enjoyed reading and want to read more about little Cookie, just as I love reading all your posts! So, I was having a read up about all the things hamsters could and couldn’t eat, I read you could give seedless apple, so whilst I was nibbling away on some apple, I bit a corner off and held it to her cage. Here comes the funny part!!! Next thing I know, she’s going insane! Since I had her she’s never ran at this speed, she was climbing, hanging from the cage upside down, she didn’t rest for 3 hours…..my Cookie Monster was hyper! After a while of her escapades, including falling on her face numerous time and looking a bit dazed, I put her in her little ball that she rolls across the floor in. 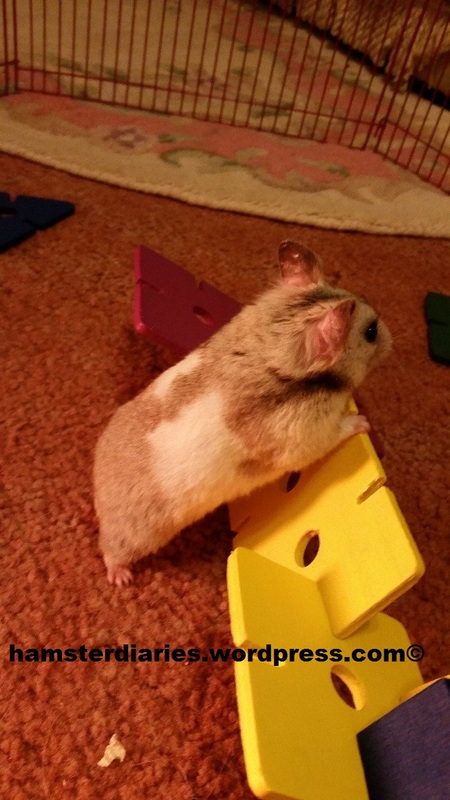 I couldn’t stop laughing at the speed and how often she would run into a doorframe…….this is the point where I’m glad hamsters can’t drive cars! Oh, what a thought, hey!? Has your hamster ever gone a bit insane and driven a car or got hyper off some food they’ve eaten ??? Let us all have a giggle at the escapades of the hammys in your life, look forward to reading it all!! I love a good hammy news story and I have an absolute WINNER for you today. I hope you animal lovers are ready to be ‘awwww’-ing and cooing all over these pictures. 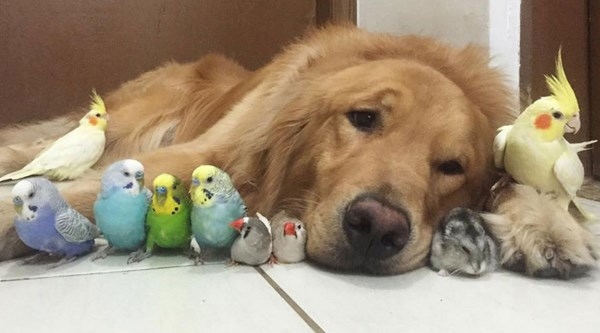 A dog owner in Brazil has shared some pictures of her gorgeous golden retriever with some unusual friends. 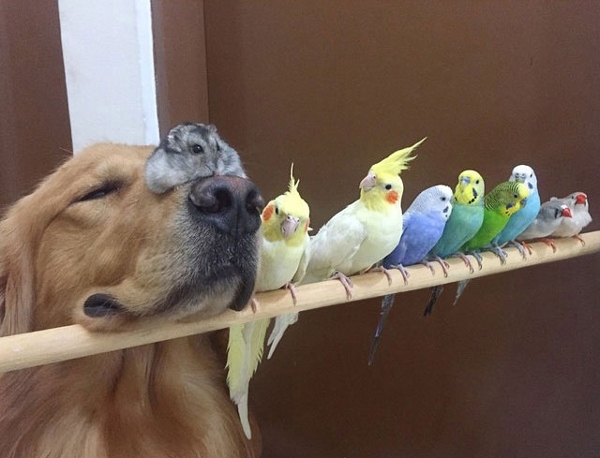 Yes Bob the Dog really is friends with 8 birdies and a little hamster!! Now I’m not going to recommend that you introduce your big doggies to the little-furries in your lives. I don’t think this is a very common case – however in this particular case, these furries are all the best of friends! I mean have you ever seen anything quite so adorable! I love seeing hamsters in the news and I love seeing hammy things going viral too! And this is right up there in my top thing on the internet ever found! I want Bob the Dog in my life. Now. I also suddenly want 8 budgies too…..
Has anyone else got an unusual furry friendship’s going on under their roof!?? The only thing Banjo gets along with is his food bowl! Dont forget to comment below your stories and make sure you’re following via email to keep up with all the hamster-y goodness! Now! Not too long ago in sunny ol’ England (bit of sarcasm there – wink) there was a heat wave! The temperature where little Cookie lives, got up to 32 degrees celcius!. Now, my poor little Cookie was not very happy with this! So I was searching up ways to help keep her cool.. Bit of a strange thing really, she comes from a Syrian desert, yet can’t take the heat!! You better stay out of the kitchen then little one. I found out that you can use a bottle of water, put this in the freezer and then when it is cold enough – not frozen – put it at the side of the cage (I put it next to her bedding) wrapped in a towel except for the side that is against the cage. This seemed to work pretty well until I thought I’d put a bottle in the freezer and hadn’t – whoops! So, my plan ended up being, using her ceramic food bowl, putting that in the freezer for 10 mins and she loved it when it came out as it was lovely and cool for her. Remember to keep your hamster happy peeps! Banjo too has been suffering a little in the heat. No-one likes melting in their beds and our little furry friends have permanent coats on too so keeping them cool is very important! Check out How To Keep Your Furries Cool for even more tips and advice on keeping your hammys happy in the heat! You don't need to have a Wordpress account to receive an email notification for every new post. You only have to pop in your email address and the rest is history! Like the sound of that?